Hand dyed fabric and threads, tarlatane, deads. 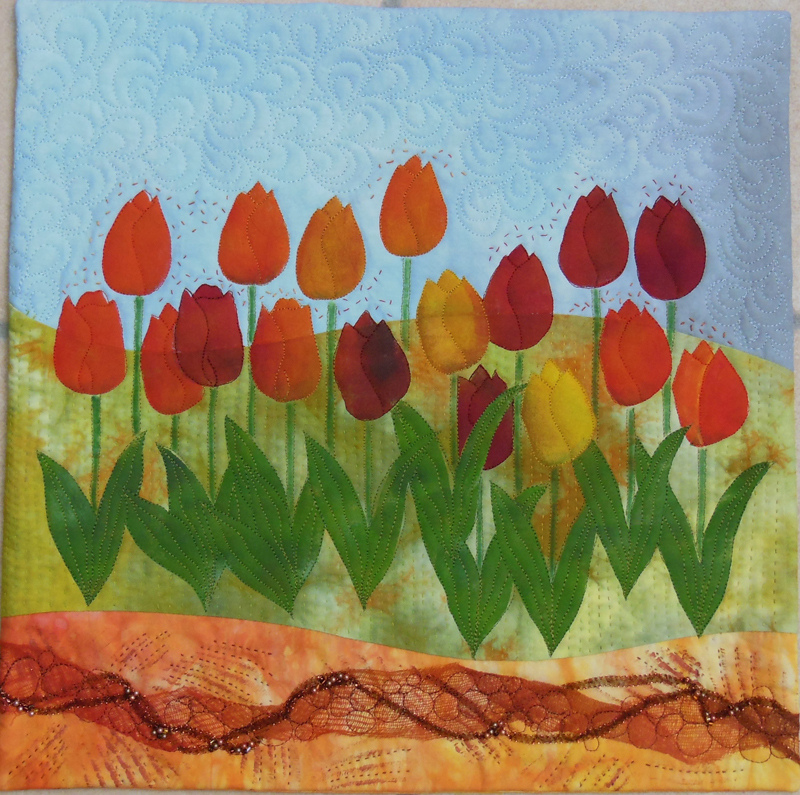 My initial design was a group of 3 tulips : I repeated it on a sheet of freezer paper the size of the quilt. When I was happy with my design, I cut out the flowers and leaves with a craft knife and ironed my freezer paper on the background fabric. Using the freezer paper like a stencil, I spread the acrylic paint( mixed with fabric medium) with a foam roller, covering my cut out shapes. I finished the stems with inktense pencils. 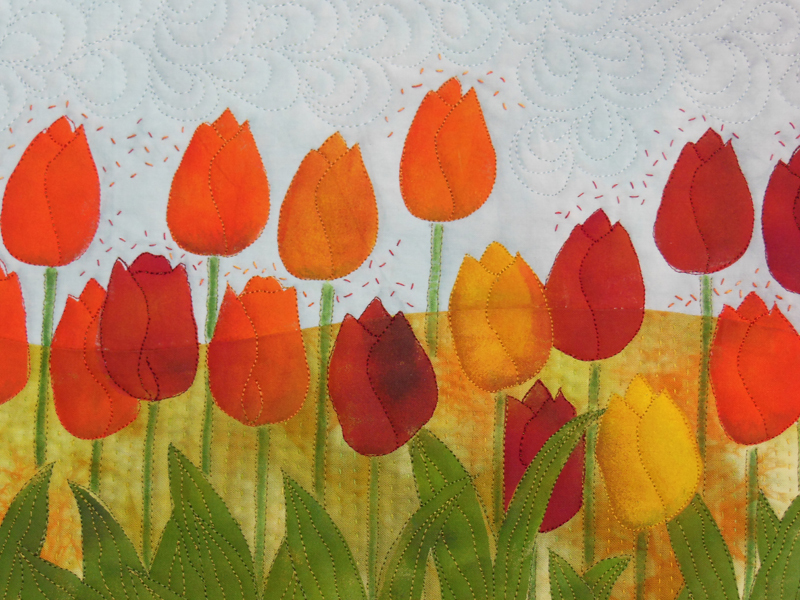 The quilt is free motion quilted, embellished with prints, embroideries and beads. This piece makes me smile. The Netherlands and Canada have had a long-standing special friendship, born in the tumult of WW II. As a result, the Netherlands gave to Ottawa, our capital city, tulip bulbs…and fields of tulips burgeon and bloom there each spring. My daughter visited there in mid-May and captured the tulip “fields” in bloom with her camera; your piece reminds me of her photos…and of Ottawa, a city near and dear to my heart. Thank you. This is so dutch. 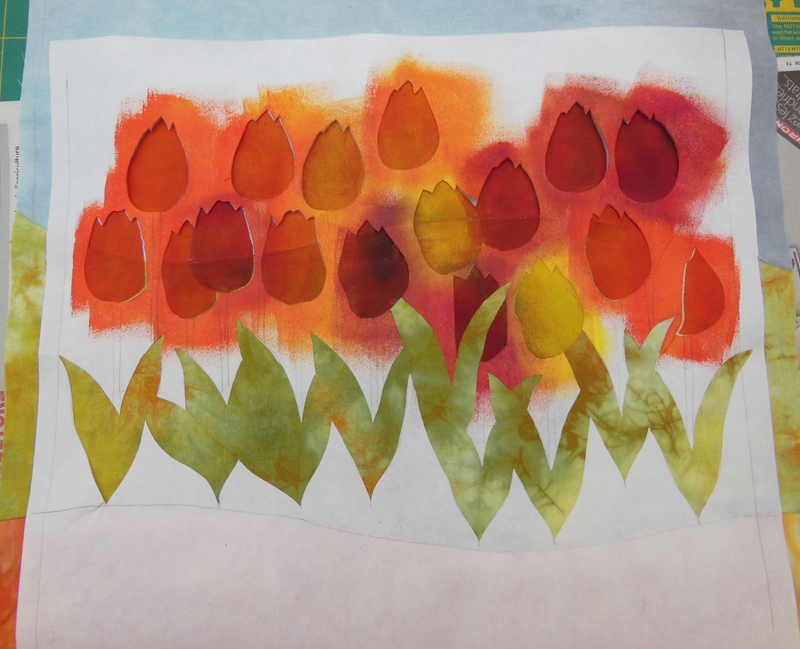 You really captured the beauty of the tulips Chantal. Love the bottom as well. This reminds me of Holland. The hand stitching is a special touch.